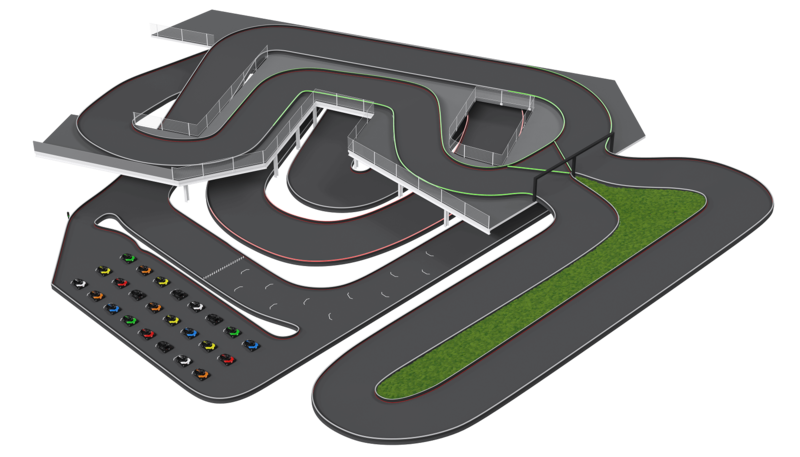 If you are interested in our solution, we will be glad to welcome you in our brand new go-kart track in Winterthur. The new track is equipped with the latest model of our go-karts and timing and management system. It serves as a prototyping and testing facility. Please contact us to arrange a tour and meeting with our team. Tomkart is a gamechanger in the rental-go karting industry. We are first company offering whole business package including hi-end electric go-karts with timing and management software and business intelligence for customers willing to renew an existing facility or develop a new one at any scale. Our main goal is to help you significantly improve your existing go-karting business or develop a new one, where your customers will love to come back. We recommend minimum 12 go-karts to ensure non-stop operation for the small size track. Six go -karts racing while another six are charging in the pit-stop. 8/4 possible in high peak. Size of track area in m2? To provide best experience to your customers and ensure highest ROI minimal area of your track should be 2000m2 excluding waiting area, bistro etc. Length of the track in m? We recommend minimum track length of 230m. Width of the track should be at least 4m in the narrowest parts. How much Tomkart with Speeder software cost? This pricing information is only informational, please contact us for accurate price offer. Delivery costs not included. When purchasing we require 50% down payment when placing order and rest payment before delivery. For business intelligence services pricing please get in touch and let’s start a conversation about your project, as we need more information to determine your needs and create an action plan with suggestions and pricing. Secure your Tomkart fleet to be delivered in 2018 now. It takes 3 - 6 months from pre-order until delivery. Since our production capacity for 2018 is limited, if you are interested in our solution get in touch with us to discuss the details of your project. Production starts January 2018. Delivery estimate for first reservations is mid 2018. Thanks to our intelligent battery management system Chargers are 100A / 72V 6KW per hour, so the price for charging: 1 minute = 0.1kWh (in average EU price of electricity one 8 minute ride on a go-kart costs between 0.052 and 0.104 Eur) - direct cost of electricity. Need to know how to start? We can help you out with everything necessary to start a successful rental go-karting business. We have more than 20 years of experience. One of our first customers operating since 2009. Located in Copenhagen. With 300m indoor track and 26 go-karts it is one of the biggest and also most popular go-kart tracks in Denmark. One of our own facilities located in Switzerland. Successfully in operation for more than 16 years now. Kartbahn Spreitenbach is also our main testing and development facility. With outdoor part of the track and a bridge it is very popular among the customers in Zurich area. Future showroom for our solution is under construction now. Opening in summer 2017, it will be state of the art, most modern indoor go-kart centre in Europe with 3 level race track, bistro, restaurant, underground parking and children playground stuffed with hi-end technology. Great example of large investment in go-karting done right. Seasonal outdoor track located in Switzerland. As a part of family entertainment park in Morschach it is a great example of integrating a go-kart facility into a bigger freetime complex to attract more customers. Great example of a small indoor go-kart track located in a small town of only 80 000 inhabitants. 230 m long go kart track, restaurant and event facilities. Successfully operating since 2013 and very popular among the customers in Slovakia. When opening it was the first centre with electric go-karts in Eastern Europe. Budapest’s only electric go-kart track located in the heart of the city, hidden underground on the -5 floor parking of Courtyard Marriot hotel. Very attractive for locals and tourists. We are looking for business partner worldwide. If you are interested in starting a new business in your region, there is a possibility of becoming a Tomkart regional distributor. Please contact us to get more information.